(186 x 267 mm) 8.3 x 11.7 in. A4 (Mounted) 7.3 x 10.5 in. (186 x 267 mm) 11 x 14 in. (272 x 360 mm) 11.7 x 16.5 in. Dhumavati, meaning the "Smoke-coloured or Smoky-one", is listed as the seventh of the ten mahavidya or 'Great Knowledge' goddesses, and is the most inauspicious in appearance. She takes the form of an elderly and ugly widow (Skt. vidhava), a role that has always held a somewhat sinister and negative connotation in Indian culture. Shrines to Dhumavati are rare and usually only found in temples dedicated to all ten aspects of the mahavidya goddesses, such as those situated in Varanasi or Kamakhya in Assam. Depictions of her are also rare, and it is considered inauspicious for married householders to display an image of her on their shrine, as she is a goddess of widowhood, poverty and misfortune. Her worship is mainly confined to the charnel grounds and to solitary places, such as an isolated crossroad or a haunted ruin. She is associated with the dark nights of the moon, or an inauspicious astrological alignment when the powers of darkness may be advantageously manipulated. She dwells within the realms of pestilence, famine and drought, the haunts of the diseased, destitute, wounded, bereaved and afflicted. Her presence can be glimpsed in the forms of lepers, beggars, widows, orphans, and the mourning of parents and children. Dhumavati is described as being thin and tall in stature, with a pale-grey or smoke-like complexion, which is likened to the darkness that endures after the final conflagration of our universe. She has withered and sagging breasts, a large nose, and her teeth are described as being protruding, long, uneven, or few in number. Her three eyes are said to be dry, bloodshot and cruel, her skin is rough and pale, her hair is disheveled, lustreless and colourless, and the pale garments she wears are worn and unclean. She is always hungry and thirsty, unsatisfied, quarrelsome, angry and severe, and she trembles continuously. With her right hand she may make the boon-granting varada-mudra, or hold aloft a piece of cloth (Skt. vastra). And with her left hand she holds an empty winnowing tray fashioned from woven strips of palm leaf, which is commonly used in India to separate the ‘wheat from the chaff’. Dhumavati’s vehicle is a chariot with either two or four wheels, upon which she sits or stands. Her vahana or vehicle is a black crow that is often shown perched on top of her chariot’s canopy or flagpole, or she may ride astride a crow that pulls her chariot. 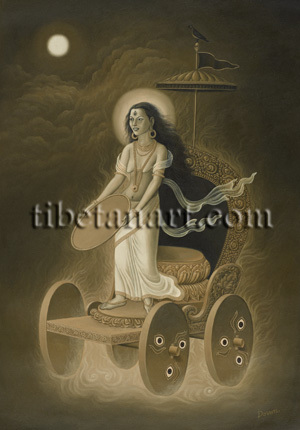 But more commonly her chariot is not harnessed to any draught animal, like a cart that is going nowhere, and this symbol of complete immobility or inertia indicates the dark quality of tamas that she embodies. As a sad and embittered widow she is quite simply a ‘woman who is going nowhere’. The Indian crow (Skt. kaka) is a bird of ill omen, an eater of carrion and a symbol of death, and in many ancient cultures, including India and Tibet, the ‘language of crows (corvomancy)’ was used as a system of divination. Here Dhumavati appears against a nocturnal background of billowing smoke lit by the hazy light of the full moon. She is tall and thin, with small sagging breasts, three piercing eyes, and her disheveled hair flows freely behind her back. She wears golden ornaments, a diaphanous scarf that billows about her shoulders, and her lower body is wrapped in the traditional white sari worn by an Indian widow. Her face bears an eerie expression of sadness and longing, and with her two hands she proffers her empty winnowing basket. She stands upright on the lotus pedestal of her immobile chariot, with her ornate lotus throne and repousse backrest appearing behind her. The shaft of her parasol bears a black triangular flag with a black crow perched above it. The base of her chariot is embellished with lotus designs, and each of its four wooden wheels is painted with the three-eyed Newar symbol of the deity Bhairava.